SUMMARY: "Worthless." "Ugly." "Fat." These are just some of the words "Skinny" whispers into Ever's ear every day. For years, Ever has endured Skinny's taunts, but after Ever's weight causes a mortifying incident in front of her entire school, Ever takes the leap to get gastric bypass surgery. 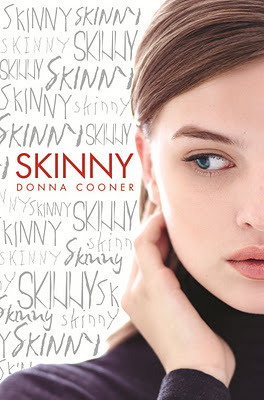 REVIEW: Skinny is the book I wish I had read in middle school. Even now, I learned a lot from Ever, and I won't soon forget the emotional impact Skinny has left on me. I connected with Ever's character right from the start. I was a chubby kid (with terrible acne) all through middle school, and Ever's negative self-talk and rejection of others because they "couldn't possibly like her" really hit home. I definitely did that then, and I think a small part of me still thinks that way 20+ years later. A negative self-image isn't easy to conquer, and Cooner captures Ever's battle so well that I can't help but think Cooner has personal experience with it. Constantly bombarded with media images and ideas of beauty, readers--both teen and adult--do not have to be overweight to empathize with Ever. I love that I never pitied Ever or thought she should do more to help herself. Ever knows she is obese, and no amount of diet and nutrition knowledge will change that for her. For Ever, losing weight wasn't about the lack of knowledge or willpower or support from friends and family; it was about Ever's psychology and making a decision to overcome despair. Even writing this review, I get the "misty-eyes" look when I think about the novel's beautifully written ending. Just WOW. I love how Cooner does not stereotype any of her characters. Even the "mean girls" have a heart and a story by the end. Everyone is different, and everyone handles adversity (or the threat of adversity) in his or her own way. This is real life. I love that I didn't always know where Cooner was going with the plot, and I rapidly turned the pages to find out. The Cinderella references make it all the more interesting and will help hook readers in book talks. The copy I read is an e-ARC from NetGalley, which includes a note from the author in the Acknowledgements. In her note, Cooner tells of her personal experience with gastric bypass surgery and weight issues as well as her childhood glee at opening the Scholastic book order flyers as a kid. I really hope Scholastic keeps this section intact in the final copy. Readers will easily connect with Ever, and the Acknowledgements section will help them connect with the author as well. How powerful is that?! Absolutely brilliant. I loved this book so much that I am nominating it for the 2013 Spirit of Texas--Middle School list (I'm on the committee, and it is too late to nominate for the 2012 list), and I am featuring it in my "Red-Eye Reads" book talk presentation at Region XI Library Harvest this September. I am glad I am not the only one to recognize Skinny's impact: Scholastic is featuring Skinny in its fall 2012 book fair line up. Middle and high school librarians should stock up on this title--I have no doubt it will be a huge hit. THE BOTTOM LINE: A powerful debut from Donna Cooner, Skinny has memorable, realistic characters that readers will connect with. Watch for this one on many "Best of" lists in December. STATUS IN MY LIBRARY: When it comes out in October, we'll have multiple copies.